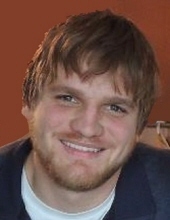 Kevin J. Roessler II age 26 of Plain passed away on Sunday, August 26, 2018. He was born on November 30, 1991 in Richland Center the son of Kevin J. and Lisa E. (Gruenert) Roessler. He possessed a warm, loving heart and was always up for an adventure. With hands as strong as his heart, Kevin spent his days working the land he loved and taking care of the people and animals that surrounded him. He captured the joy in everything and lent his active mind to the resolution of every task at hand on the farm. A loving son, brother, uncle, grandson, and devoted friend, his quick wit and sensitive soul will forever be remembered. Kevin was a member of St. Patrick’s Catholic Church-Loreto Ridge and graduated from River Valley High School in 2010. Survivors include his parents, Kevin and Lisa Roessler of Plain, his sister, Hailey Roessler of Ridgeway, his maternal grandmother, LaVonne Gruenert of Reedsburg, his paternal grandfather, John Roessler of Plain, paternal grandmother, Joan Roessler of Madison, a nephew, Odin Roessler of Ridgeway, aunts, uncles, other relatives and special friends. He was preceded in death by his maternal grandfather, Fredrick Gruenert. A Mass of Christian Burial will be held on Friday, August 31, 2018 at 11:00 A.M. at St. Patrick’s Catholic Church Loreto Ridge. Fr. Sanctus Ibe will officiate with burial in the Our Lady of the Fields Cemetery. Visitation will be held on Friday at the church from 9:00 A.M. until the time of Mass at 11:00 A.M. In lieu of flowers, memorials may be made for an Agri-Business Scholarship to be set up at a later date. Online condolences available at www.staffordfuneralhomes.com. The Richardson-Stafford Funeral Home is assisting the family with the arrangements. "Email Address" would like to share the life celebration of Kevin J. Roessler, II. Click on the "link" to go to share a favorite memory or leave a condolence message for the family.